Skype Video Chatting Software for Linux With Voice Call. 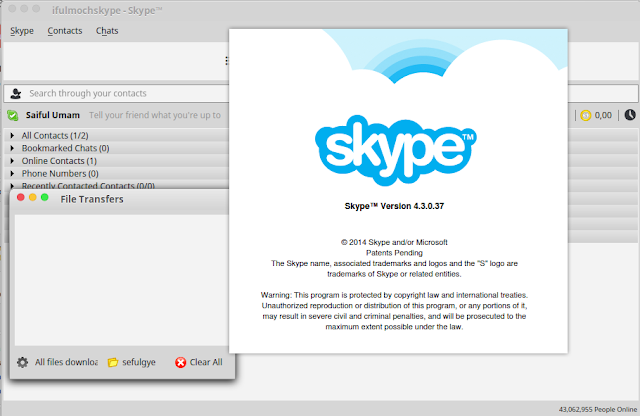 This will guide you how to install Skype as the video chat program for Linux with voice call over internet capabilities. Skype is for doing things together, whenever you’re apart. Skype makes it simple to share experiences with the people that matter to you, wherever they are. Skype is dedicated to helping you do things together whenever you’re apart. an application that specializes in providing video chat and voice calls. Users can also exchange text and video messages, files and images, as well as create conference calls. Skype is available on Microsoft Windows, Mac, or Linux, as well as Android, Blackberry, iOS, and Windows Phone smartphones and tablets. Skype is based on a freemium model. Skype to Skype calls: Call anyone else on Skype for free, anywhere in the world. Calls to mobiles and landlines: Call mobiles and landlines worldwide at low rates. Group calls: Get a group of people together on one call – you can add up to 25 people. Skype Number: Your friends call a number and you pick up on Skype wherever you are in the world. Forward calls: Not on Skype or can’t pick up? Simply get your Skype calls forwarded to any phone. Caller ID: Don’t be an unknown number… Let people know it’s you calling them. Skype To Go: Call international numbers from any phone at low calling rates. Skype Click to Call: Switch between browsing the internet and making calls with just one click. One-to-one video calls: Get closer with a face to face catch up. Group video calls: Get a group of friends together at the same time on a video call. Mojis and emoticons: Discover fun new ways to express yourself in a Skype chat. Video messaging: Send a message you can see, hear and feel. Instant messaging: Talk with your fingers - gossip away, plan a trip, work on a project – all in an instant. Send texts (SMS): Text message friends from the comfort of your keyboard. Voice messages: Too busy to talk? Allow Skype to take a message for you. GroupMe: Share messages, photos and your location on your mobile. Send files: Send files, photos and videos of any size over Skype. Simply drop or add the file into your Skype chat. Screen sharing: Share your computer screen with the person you’re talking to. Group screen sharing: Get everyone on the same page on a group video call. Send contacts: Share a contact, number and Skype Name easily.